Home > Air Travel > Plane or Train? It is a strange twist to something as scientifically complex and intricate as climate change that much of the mainstream debate, especially about travel, has become rather black or white in its approach – forcing any given means of transport to be seen as either “good” or “bad”. Unlike the old cowboy films, however, real life is seldom populated with such readily distinguishable heroes and villains wearing conveniently coloured hats. The difficult travel discussions – and the plane/train dilemma probably tops this list – come when the truth lies somewhere between several shades of grey. There is an apocryphal tale of a member of the cabin crew on a trans-Pacific long-haul flight being asked the time by an awaking passenger. Looking out of the aircraft window at the endless blue water beneath them, she replied “where?” – and much of the plane or train debate centres around exactly this question. The "where" of your departure and destination inevitably affect your options, as well as the environmental and economic costs of the decision and to muddy the waters still further, these goalposts seem always to be shifting. At the extremes, as always, the issue is self-selecting – flying is never going to be an option to travel to the next town, any more than going to Australia will have you queuing up to buy your rail ticket. The middle ground is, of course, where the decision becomes altogether much more difficult – as illustrated by internal or short international. Economically, at least at present, aviation holds the distinct advantage, being heavily subsidised by the public, which makes for a distinctly uneven playing field. Aviation fuel is un-taxed, air fares are exempt from VAT, the Civil Aviation Authority (CAA) sets a cap on airport landing charges and duty-free to non-EU destinations plays a small but significant role in the overall economics of the industry. The meteoric rise of budget, no-frills airlines such as EasyJet and RyanAir has also played a major part, making flying between many UK destinations significantly cheaper than travelling by the equivalent rail routes. While it has been estimated that removing these subsidies – making the transport market more equal and competitive – could reduce the demand for flights by up to 30 per cent, it would probably be political suicide for any government that choose to do so. However, some increase in aviation taxation over the coming years is probably fairly likely, particularly given the rise of the environment as one of the key priority zones for all of the major parties. It is widely believed in the industry that such changes would be felt most strongly by the budget airlines – which is good news in terms of keeping down the fast expanding passenger numbers, but would almost certainly herald the demise of cheap getaways. Train travel is universally recognised as the least polluting method of mass transport and streets ahead of aviation, which has been roundly cast in the role of villain for this segment of the plot. From an environmental standpoint, for internal – and even some short international – trips the train wins hands down. It has been estimated that if all domestic flights transferred to rail by 2015, carbon emissions would drop by between 118,000 – 362,000 tonnes and nitrogen oxides by 18,000 – 58,000. If this were extended to include appropriate European destinations also, the emissions would fall by 145,000 – 402,000 tonnes and 23,000 – 64,000 tonnes respectively. The real question is, is it realistic to think that railways can replace air travel in this way? Part of the answer depends on the economics – and whether carbon tax and the further consolidation of low cost carriers does eventually consign cheap flights to the history books, as some commentators have predicted. However, at least as important are the issues of convenience and conscience. Clearly for increasing numbers of people, travel choices are being heavily influenced by environmental considerations – and trains have strong green credentials. While taking the train to southern Spain, for example, is unlikely ever to be a serious prospect, for destinations in southern France the picture is altogether different – at least if you live in the south-east of England. 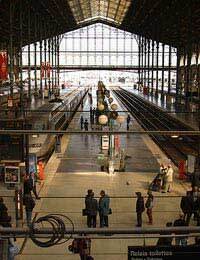 Travelling by Eurostar from London to Avignon, via Paris is around a six hour trip – which compares pretty favourably with doing the route by plane, once you add in all the time taken hanging around and travelling to and from airports at either end. Aviation is the fastest growing contributor of greenhouse gases; so clearly, if we all stopped flying altogether emissions would certainly fall. However, this returns us to a rather simplistic black and white view again – and for some trips flying will always be the only practical option. However, the success of the website “The Man in Seat 61” – which provides information on travelling by rail from the UK to Europe and beyond – shows that people are increasingly exploring rail, where once booking a flight would have been automatic.